We have collected and analyzed 5 expert reviews and 43 user reviews from international sources. Experts rate this product 52/100 and users rate it 58/100. The average review date is Jun 14, 2006. We have compared these reviews to 367686 reviews from other Camcorders. The alaScore™ for this product is 75/100 = Good. Last update: Apr 21, 2019.
alaTest has collected and analyzed 38 user reviews of Samsung SC-X105L from Amazon.com. The average user rating for this product is 2.9/5, compared to an average user rating of 3.9/5 for other Camcorders on Amazon.com. People are impressed by the battery and durability. The price and portability also get good feedback, whereas some have doubts about the color and image quality. Views are divided on the memory. 47% of the reviews on Amazon.com give this product a positive rating. It does just about everything (video, pictures, music) except shoot good video. Extremely portable and very light. Additional external cam included. Mediocre video quality. Poor digital stills. 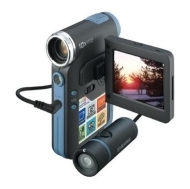 Extremely compact design; novel external camera attachment; 512MB of onboard memory; long-lasting battery. Overlong start-up time; subpar video quality in nearly every respect. The Samsung SC-X105L has a fetching design and some novel features, but it suffers from subpar video quality. Samsung SCX105 MPEG4 Sport Camcorder w/10x Optical Zoom. Video! Stills! MP3! External Camera! Wow!!!! I've been using this great little tapeless camcorder for the last week nonstop and wanted to start writing about it since nobody I've showed it to has any idea what it is! Samsung's SC-X105L MPEG4 Sports Camcorder offers the ability to capture those thrilling moments. Whether you're snow boarding or skiing you can capture the moment with the remote lens. 10x Optical Zoom/100x Digital Zoom provides incredible zooming ability. Variable speed control is activated by automatic sensing of the amount of pressure applied to the zoom tab. Record an MPEG-4 digital video clip, which has high picture quality and takes up little memory space. Video can be stored directly to your Memory Stick or transferred to your PC via USB. 680K Movie Optimized CCD delivers high-resolution video images with superior color resolution and detail. It surpasses the conventional camcorder with digital quality and its high performance PC interface. Camera body is pocket-size and offers a non-slip surface. The included external remote lens offers wide-angle capabilities, is weather-resistant, and allows for hands-free shooting. Electronic Image Stabilization (EIS) minimizes unwanted picture shaking caused by hand movement during recording. Photo Mode Function allows for easy picture taking (800 x 600 resolution) and the ability to save still pictures into Memory Stick or Memory Stick PRO. 512MB Built-in Memory allows you to take photos and MPEG4 movies more conveniently. Combining built-in memory and Memory Stick PRO allows you to store your still images, MPEG4 movies, and important documents and files allowing you to review them anytime, anywhere.